In the wake of abusive comments aimed at AFLW star Tayla Harris, the AFL world has rallied behind the 21-year-old to fight back against the haters. 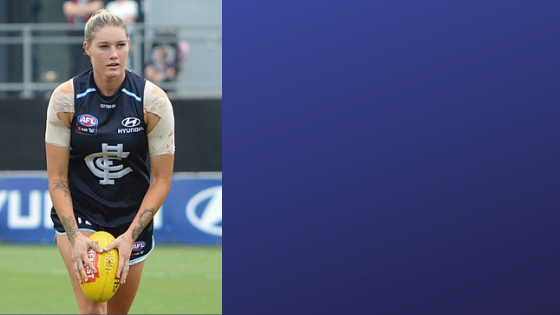 Carlton AFL Women’s key forward Tayla Harris has fought back after trolls took to social media following a picture taken by Michael Wilson during her game on the weekend. The Blues forward was midair, kicking for goal against the Western Bulldogs when the photo was taken. It quickly sparked attention from online trolls who made sexual comments about her athletic and unconventional kicking style. Harris took aim at those who made derogatory and misogynistic comments about her, retweeting the picture of her at work out on the footy field. Speaking to Radio Sport National the talented forward made her frustrations known. “The comments I saw were sexual abuse, if you can call it that, because it was repulsive and it made me uncomfortable,” she said. Harris said she was appalled and upset with the comments made by online haters highlighting how these comments not only affect her but so too women in general. “I don’t want to give oxygen to the trolls, but one thing that happens to come to my mind when I saw the comments … I can see in people’s photos they’ve got kids, or they’ve got daughters or women in their photos even, and that is the stuff I’m worried about,” she said to the ABC. Why is everyone criticising Seven Network? While many major figures supported Harris, the Seven Network also came under fire after taking the photo down in spite of the vile comments made online about the image. Federal Minister for Women, Kelly O’Dwyer was more than dissatisfied with the way that Seven dealt with the issue of online trolls according to an article in the Guardian. “I was pretty frankly disgusted by Channel Seven’s response in actually taking down her picture rather than dealing with the trolls,” she said. Seven quickly apologised for their actions vowing to help find those who were responsible for the comments and are now working with the AFL Integrity Unit to hunt down those who made the inappropriate comments and ban them from the sport. What’s everyone saying about it? Despite the abusive comments the support for Harris has been endless with AFL photographer, Michael Wilson, backing her. Talking to the ABC, Wilson, hopes that his image of Harris having a shot at goal and the events that followed will pave the way for the future and put an end to online trolls. “I think we’ll look back on this moment and hopefully it’s a line-in-the-sand moment where we take a stand against these online bullies,” he said. Wilson continued to lend his support to Harris by highlighting the need for change within society calling out online trolls. “Women especially shouldn’t have to put up with derogatory comments and negative feedback just because you’ve got these keyboard warriors out there who think they can hide behind their screens,” he said. Victorian Premier, Daniel Andrews also came out in support for Harris comparing her to the likes of Ted Whitten, given their unique kicking style. With the support of the premier behind her, both AFL CEO Gillon McLachlan and AFLW boss Nicole Livingstone also chimed in to lend their support for Harris calling out online haters in an article on Nine’s Wide World of Sports. “In the end, all I want to be clear about is it’s an amazing photo and that’s the overwhelming consensus, I feel. That’s what people see. She’s a star AFLW player, it’s unacceptable commentary and people are holding those comments to account,” McLachlan said.